For the first two summers that I had my '95 YJ, the hard top had to sit on a wooden palette on my lawn whenever it wasn't on the Jeep. Not only was it unprotected from the elements and vandals, but it also required two strong people to lift it off the Jeep and over the yard fence. When I got married, I made sure we got a place with a decent garage so that I had a place to store my top. 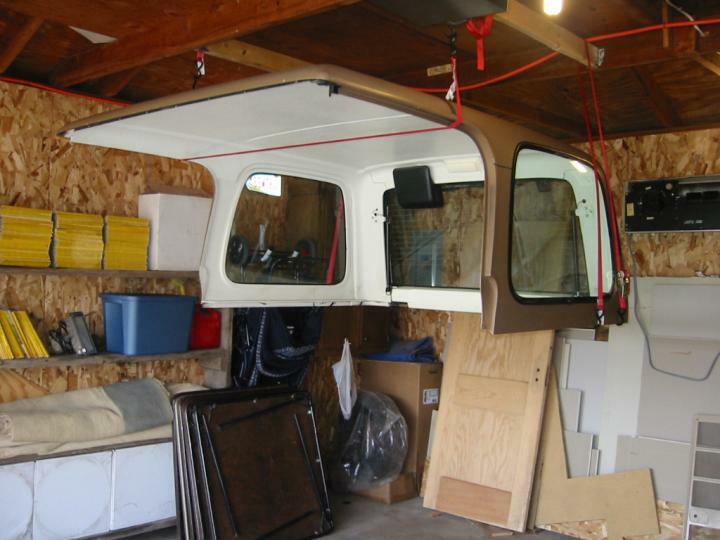 I wanted a hard top hanger/hoist to put in the garage so that I could easily remove the top by myself and store it without wasting valuable parking space. I've seen hangers/hoists advertised in catalogs for $100-140, but that just seemed a bit pricy to me, so I decided to make my own. The original design cost about US$50, but it was somewhat unstable, had a single point of failure that would allow the top to come crashing down (it never did), and required lots of head room between the top & the garage rafters. When we moved again & I lifted my Jeep (the body now sits 9" above stock), I had to come up with a different design. Here's what I use now. It only cost about US$25, is much more stable, and requires virtually no head room between the top & the garage rafters. I think David Rush probably gets credit for giving me this idea. Basically, I hang the top from my rafters via four 10' ratchet straps. It's much more stable than the old method. I added two new 2x4's between the rafters in my garage (parallel to my two rear side windows) from which to suspend the ratchet straps. 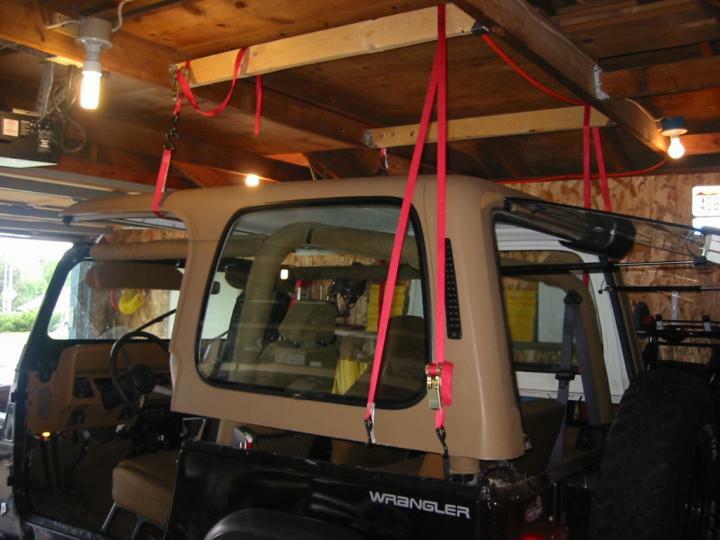 Back the Jeep into the garage so that the top is positioned below the rafters where the ratchet straps hang. 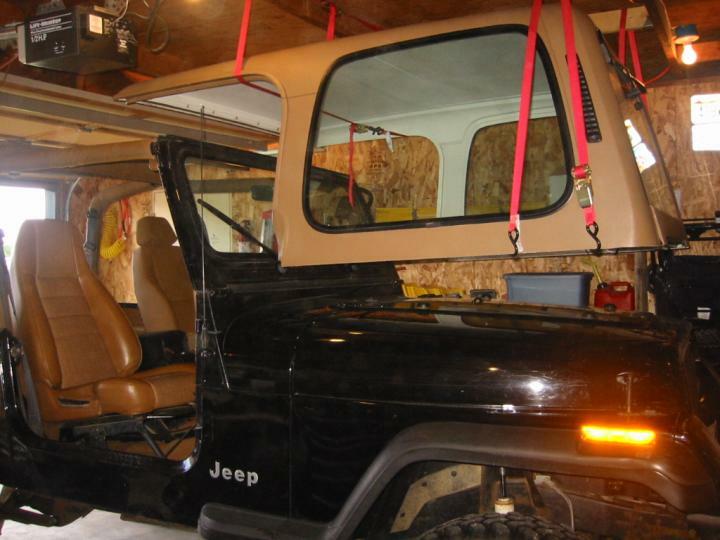 Unfasten the top from the Jeep and remove the doors. Use one strap per rear corner on the top. Hang each strap over its respective rafter and hook both ends under the same rear corner of the top. Up front, use two straps (or one long one) to form a loop around both rafters and down under the front lip of the hard top. Once all the straps are hooked up, just tighten each corner an inch or two at a time until the top is as high as you want it. You need to raise it a minimum of 3-4" (10cm) before the front strap clears the roll bar so you can drive out from under it. My top hangs there all summer (May-October). It's high enough that either our Chevy Tahoe or my YJ can park under it when it's hanging there. If I could hang it closer to the back wall of my garage, I could probably even get my Wagoneer's hood in under it with the garage door closed. 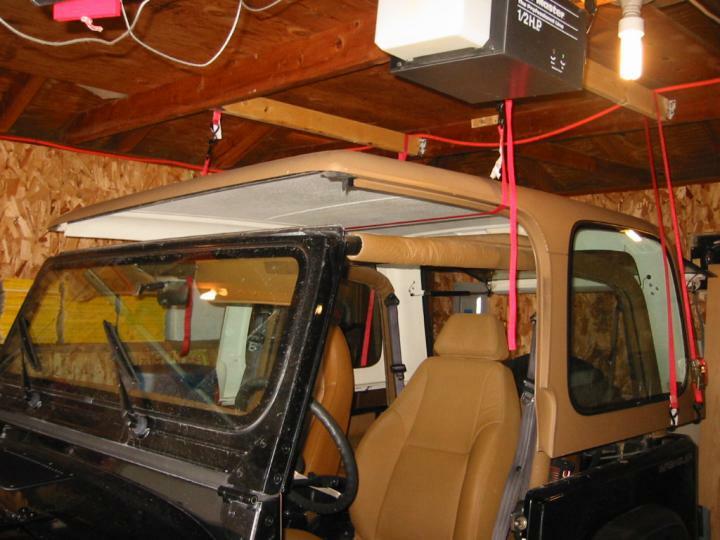 If you have questions about this hoist or want to discuss ideas further with other folks, be sure to check out the Jeep Tech forum on our message board.